The nature and development of the empire of the Ilkhans in Persia, Mesopotamia, and Syria is perhaps the most interesting of all the stories of these Mongol powers, because in this region nomadism really did attempt, and really did to a very considerable degree succeed in its attempt to stamp a settled civilized system out of existence. When Jengis Kahn first invaded China, we are told that there was a serious discussion among the Mongol chiefs whether all the towns and settled populations should not be destroyed. To these simple practitioners of the open-air life the settled populations seemed corrupt, crowded, vicious, effeminate, dangerous, and incomprehensible; a detestable human efflorescence upon what would otherwise have been good pasture. They had no use whatever for the towns. The early Franks and the Anglo-Saxon conquerors of South Britain seem to have had much the same feeling towards townsmen. But it was only under Hulagu in Mesopotamia that these ideas, seem to have been embodied in a deliberate policy. The Mongols here did not only burn and massacre; they destroyed the irrigation system that had endured for at least eight thousand years, and with that the mother civilization of all the Western world came to an end. Since the days of the priest-kings of Sumeria there had been a continuous cultivation in these fertile regions, an accumulation of tradition, a great population, a succession of busy cities, Eridu, Nippur, Babylon, Nineveh, Ctesiphon, Bagdad. Now the fertility ceased. Mesopotamia became a land of ruins and desolation, through which great waters ran to waste, or overflowed their banks to make malarious swamps. Later, on Mosul and Bagdad revived, feebly as second-rate towns… . But for the defeat and death of Hulagu’s general Kitboga in Palestine (1260), the same fate might have overtaken Egypt. But Egypt was now a Turkish sultanate; it was dominated by a body of soldiers, the Mamelukes, whose ranks, like those of their imitators, the Janissaries of the Ottoman Empire, were recruited and kept vigorous by the purchase and training of boy slaves. A capable Sultan such would obey; a weak or evil one they would replace. Under this ascendancy Egypt remained an independent power until 1517, when it fell to the Ottoman Turks. The first destructive vigor of Hulagu’s Mongols soon subsided, but in the fifteenth century a last tornado of nomadism arose in Western Turkestan under the leadership of a certain Timur the Lime, or Timurlane. He was descended in the female line from Jengis Khan. He established himself in Samarkand, and spread his authority over Kipchak (Turkestan to South Russia), Siberia, and southward as far as the Indus. He assumed the title of Great Khan in 1369. He was a nomad of the savage school, and he created an empire of desolation from North India to Syria. Pyramids of skulls were his particular architectural fancy; after the storming of Ispahan he made one of 70,000. His ambition was to restore the empire of Jengis Kahn as he conceived it, a project in which he completely failed. He spread destruction far and wide; the Ottoman Turks -it was before the taking of Constantinople and their days of greatness-and Egypt paid him tribute; the Punjab he devastated; and Delhi surrendered to him. After Delhi had surrendered, however, he made a frightful massacre of its inhabitants. At the time of his death (1405) very little remained to witness to his power but a name of horror, ruins and desolated countries, and a shrunken and impoverished domain in Persia. 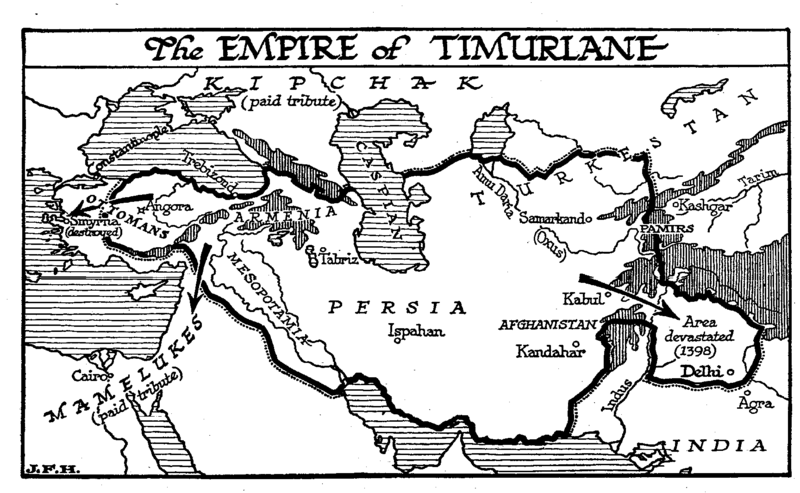 The dynasty founded by Timur in Persia was extinguished by another Turkoman horde fifty years later.